We’d love your help. Let us know what’s wrong with this preview of The Small Heart of Things by Julian Hoffman. In The Small Heart of Things, Julian Hoffman intimately examines the myriad ways in which connections to the natural world can be deepened through an equality of perception, whether it’s a caterpillar carrying its house of leaves, transhumant shepherds ranging high mountain pastures, a quail taking cover on an empty steppe, or a Turkmen family emigrating from Afghanistan t In The Small Heart of Things, Julian Hoffman intimately examines the myriad ways in which connections to the natural world can be deepened through an equality of perception, whether it’s a caterpillar carrying its house of leaves, transhumant shepherds ranging high mountain pastures, a quail taking cover on an empty steppe, or a Turkmen family emigrating from Afghanistan to Istanbul. The narrative spans the common—and often contested—ground that supports human and natural communities alike, seeking the unsung stories that sustain us. Guided by the belief of Rainer Maria Rilke that “everything beckons us to perceive it,” Hoffman explores the area around the Prespa Lakes, the first transboundary park in the Balkans, shared by Greece, Albania, and the former Yugoslav Republic of Macedonia. From there he travels widely to regions rarely written about, exploring the idea that home is wherever we happen to be if we accord that place our close and patient attention. To ask other readers questions about The Small Heart of Things, please sign up. For a moment, it promised something interesting, before becoming platitudinous. This book came highly recommended by Terry Tempest Williams, and that was enough to intrigue me. I've become somewhat allergic to conventional nature writing, but she assured that this was different, merging natural history with the social and cultural to create something more open than the usual paeans to wild places. And the beginning seemed to fulfill that promise. Hoffman was open. He was unwilling to For a moment, it promised something interesting, before becoming platitudinous. And the beginning seemed to fulfill that promise. Hoffman was open. He was unwilling to say that certain places were better than others, better homes--this counts as radical in the staid confines of nature writing--and early chapters continued this theme. Well, they're not really chapters: the book is more a collection of essays that circle around the meaning of home. One might quibble a bit about his focus on these more outstanding species. And there's a sneaking elitism, too: he quotes Rilke about the beckoning world (this provides the subtitle) and pats himself on the book for bothering to notice what so many ignore--but that's ok. He's noticing that there is nature in the city. That there are homes here, and a sense of place. But then he and his wife tire of their commutes and move to Greece, a choice largely made because of the birds in the area. And the rest of the book becomes routine. He sings the praises of the pastoral life and its more humane rhythms. He loves that there are some birds he rarely sees--because it means the world is wild. He talks of his neighbors--he lives near Albania and Macedonia. He compliments their welcoming nature. The language slips and becomes boringly conventional, like a travel brochure, not like lived experience any longer. Exact phrases are repeated in separate chapters of this very slim book. According to some of the paratext, the Hoffmans worked a farm when they first moved to Greece, and I guess that's true, but most of the rest of the book (all? I remember no counterexamples, but might have missed something) makes them out to be the traditional heroes of pastoral nature-writing: they are observers. Again and again, they are on holiday, staying in some hotel where they can see new birds. Hoffman is beckoned by the world, and his special astuteness allows him to see what others miss. But the social and cultural world is described in textbook terms--it's only the bird life that actually feels as though it were understood through experience. The true work of those beckoned by the world is looking at it, not working it. (I imagine coming from London to Greece would have made them fairly well-off.) Hoffman's is the usual very privileged position. Being home and being at home, place and finding one's place and finding both in nature no matter where you find yourself are some of the themes to this wonderful book. Written as a series of essays that wander about a little much as the author has done I found it hard to put down at times. In fact, I left the last 4 or 5 pages for quite a few days not wanting to finish. I would recommend this book to nature lovers, travel lovers and those searching for their place in the world. My friend Julian Hoffman's book is an fascinating collection of essays about the relationships we develop with certain locations, thereby making them into ‘places’, and sometimes even homes. Such relationships are honed through our experiences in these locations: the things we see, the people we meet, the attention we pay. As the book's title implies, it's often the small things that make a location special: an encounter with an animal, a conversation with a stranger, a walk with a friend. Most o My friend Julian Hoffman's book is an fascinating collection of essays about the relationships we develop with certain locations, thereby making them into ‘places’, and sometimes even homes. Such relationships are honed through our experiences in these locations: the things we see, the people we meet, the attention we pay. As the book's title implies, it's often the small things that make a location special: an encounter with an animal, a conversation with a stranger, a walk with a friend. 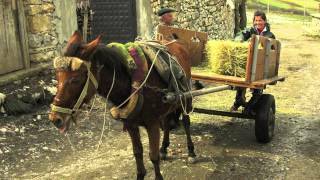 Most of The Small Heart of Things is set in Hoffman's adoptive home in the Prespa Lakes region of the Balkans, sitting astride the borders of Greece, Albania, and the Former Yugoslav Republic of Macedonia. But the book also travels farther afield, with flashbacks to Hoffman's time in London and the North of England, and with excursions to Transylvania, the Bucharest Natural History Museum, Istanbul's Grand Bazaar, and elsewhere. There's even a Skype call to Canada, and a chance meeting with an old friend on a train bound for Romania. In his essays, Hoffman encounters bear tracks and caterpillars, eagles and salamanders, shepherds and immigrant workers, beavers and moths, Turkmen traders and a mysterious man with a limp. Every one of these encounters, and the many others described in this highly enjoyable book, leave a lasting impression—both on Hoffman, and, by way of him, on us. 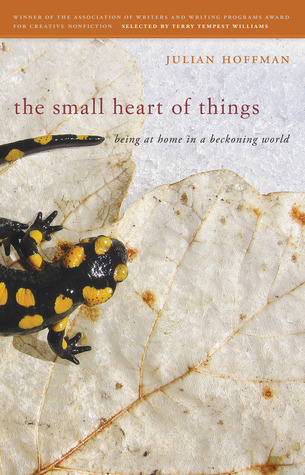 A clear-eyed walk through landscapes and the evocative places of Prespa, The Small Heart of Things tells us much about nature and our varied, conflicted relationships with nature. Rambly. Sure, that was partly the point of this book, to reflect the ramblings in nature of the author, but it was definitely excessive in a lot of places.